Hi there . I am rather the newb at speaker building and this will be my first full-range attempt . In fact this will be the 4th pair of speakers I am building . I've just ordered a pair of Seas FA22RCZ drivers , and , whilst researching box designs for them , come across the ZOB's . .... convinced me to buy these plans . I plan to build the ZOB's from MDF . I was also wondering whether there is an advantage in using solid wood for the front panel as oppossed to MDF ? I am worried that MDF may damp the response more than wood . :-? Any help will be appreciated . You need to purchase plans from Decware. It would be great to see the result of this driver in a ZOB cabinet, if it is the one that I am thinking. It is a really expensive driver correct? Seems that there was some discussion about in the past. yeeehah! Even I wince at such a price. That's when I really would like to blind test such things against the competition. Blind tests don't work and some things are just too expensive for a long term evaluation. Has anybody blind tested the blind tests? Yesterday at 4:46pm Modify Remove Hi there . I am rather the newb at speaker building and this will be my first full-range attempt . In fact this will be the 4th pair of speakers I am building . Advantage to using solid wood vs. MDF for the front panel is that solid wood could look better and could last longer depending on the finishing. The reason the front baffle is so thick is to create more mass than the rest of the cabinet panels. Either material accomplishes that. While wood with grain can be more lively, the fact that there are two layers of 12mm hardwood with different grain patterns may result in a co-mass layer damped composite where the two layers fight each other with unique resonance patterns. That may give similar results to the composite MDF. Point is, the gross mass of the baffle vs. the mass of the driver's moving parts makes any differences between the two woods too hard to hear or measure. The box portion of the cabinet, lacking a driver to inject energy into the panels or high pressures for that matter, has too little resonant energy to worry about, so it too is very dead compared to a normal speaker. Mount the baffle on 4 pins with a felt gasket and compare that to having the baffle fully glued to the cabinet. NOTE: Since the baffle is high mass the driver should be as tightly bonded to it as possible. The ideal would be to have the speaker frame and the baffle be a single unit as in all one piece. So to that effect one could dispense with the gasket, machine the back of the frame flat, secure it to the baffle with hard setting epoxy or line the parameter with hold down clamps and screws every inch or so. On the rear side of the driver, every surface that the speaker cone can see should be covered with convoluted foam or heavy loosely packed felt. The slot board should be all the way open. The slot board can be seen by the rear of the speaker cone. It should be covered with foam as well. On the front of the cabinet, just below the driver, a 12x12x2 inch foam tile should be placed with the slots oriented vertically. This looks like crap on the front of the speaker, to it's usually temporarily placed there during listening sessions only. The closer the proximity to the corners, the better it is to have diffusion panels dealing with some of the back wave on both walls. Alternately, you can experiment with checkerboard patterns of foam tiles. The interior resonant chamber should be loosely stuffed with fiberfill. If other speakers are placed in the room, the ports of the ZOB resonant chamber should be covered with a book when any of those other speakers are being used. When everything is said and done, you might even experiment with a 4 inch tube on the magnet of various lengths (tightly stuffed) to act as a wave guide similar to the FRX driver and see what that does to the imaging. So there you go... one extreme to the other, too little information, too much information. Yes , I did buy the plans . Hi Steve , thanks for the comprehensive info . So .... from what you're saying , I gather that attaching the front ( baffle) as tightly as possible to the box will improve box resonance , including attaching the driver as tightly as possible to the baffle . I have some ABE Epidermix 372 which is the most serious hard setting epoxy I've come across . Is it better to recess the driver slightly ? So that the front of the driver frame is flush with the front of the baffle ? I guess that the felt at the back is to absorb higher frequency resonance . Similarly , I guess that flaring the back of the cut-out in the baffle may help too . Excellent info, Steve. I just completed my ZOB build, so I'm looking forward to trying these tweaks. I have a roll of F11 acoustical felt, which is what I used as t he gasket between the baffle (6/4 hard maple butcher block) and the cabinet (18mm MDF). I'll also use it to cover the reflective surfaces of the cabinet seen by the driver cone. I have not stuffed the chamber yet, but will do so. I'm curious to try the PVC pipe on the back of the magnet idea. I'm using the TangBand W8-1808, so I'm not sure what the magnet diameter is. I attached my baffle tightly by making a "cleat" that is screwed to the back of the baffle, and slides over the 6" piece on the bottom front portion of the cabinet, the top of the baffle is screwed to the cabinet through the cross support at the top of the sides (I added that piece for extra stability of those long flexy side panels). I used threaded inserts I the baffle back so I could pull it tight to the cabinet, yet easily take the screws out should I want to remove the baffle (which I will be doing soon, since the baffle isn't finished yet). Pics of my ZOB's are posted in a separate thread. I am adding some photos to help explain my choices for the ZOB. In the photos of the rear of the speaker, you will see that I have used a curved piece of memory foam. I left a gap between the foam and the slot to allow bass to pass there. In the photo of the front, I flush mounted the driver, and right at that point beveled the baffle back about 10 degrees if I recall correctly. I am glad that I did it, knowing that it will help the baffle 'act' a little smaller than it actually is. Rounding over the back of the mounting hole seems as though it is a good idea as well. It is easy to say that I am thoroughly impressed with these speakers for the last 2 1/2 years. I have used the mainly two different drivers in them, i.e. Audio Nirvana 8" cast, w/alnico magnet. Then I switched up to the FRX2. For me it was a reasonable improvement. I even had the original FRX driver in there for a very short time, but I killed it in cold blood with an incorrect connection. Is the hard maple one solid piece of wood , or planks laminated together ? I'm quite interested on how a solid piece of wood would resonate . Although costs probably limit me to 25mm ( ~ 1" ) MDF for the baffle and 16 mm MDF for the rest . Oh wow ... Beautiful build 4krow ! Amazing ! Posted whilst I was typing this . I'm paying attention to foam use , I was even wondering about appling foam to the outside of the tube round the speaker magnet that Steve suggests . Actually I used 8/4 cherry for my baffles, and FWIW, rosewood for part of the rear cabinet. The cherry is one piece, and at it's thickness and mass, I don't worry too much about resonance. The reason is that I actually don't play these very loud. Yes , I imagine that these should be used for " cleaner " listening . Not Industrial psychedelic hard-rock . Maybe some Al di Meola and the likes . Might I ask what you use to power your beautiful creation ? Thanks for the compliment. I did work hard on these speakers, and fortunately wasn't disappointed in the end result. Out of sheer luck, I was talking to Steve last spring, and he had a SE34.4( not sure of the exact model sorry) for sale. As it turns out, it was the prototype for this series of amps, and had quite a few upgrades included. Anyway, I made a few changes of my own, and am trying to quit while I am ahead. Too much of a good thing and all that. Beautiful stuff 4krow . I have yet to get into the tube game , but I can feel the day drawing nearer . Thus far I have a tube pre , made in South Africa by German-born , and now deceased Gunter Steinhart . My power amps are all solid-state or class D beasts , built from imported modules ( all rated at 200-250wpc were the appropriate x-former applied ). I'm afraid they may blow the Seas drivers out of their frames if restraint is not exercised . I've been reading about the first watt thing for some time now , maybe time to get my feet wet . Moderation in all things, even audio. Speakers will give a heads up for things like over-excursion, so that is something to listen for . Also, there may be exaggerated distortion at their limits. I share your concern though when the amplifier can easily cook a unit without strain. I think that I was running a 50 watt Threshold when I cooked one set of drivers. It was done before I could get up from the couch. But in my case, it wasn't a music signal, but an incorrect connection that I had made before I hit the play button. Anyway, having a tube pre-amp like the one you do is a good start for getting the sound to behave in a 'tubey' way. I have found more influence from a pre-amp than a power amp in most cases, regardless of SS or tube. Moderation is indeed something I can hopefully learn one day . I got into the audio game about 4-5 years ago and am an uncontrollable addict . The amount of gear I've acquired is quite staggering . Fortunately I am slowly learning to part with pieces now , so that things may become the transient learning curve I often accused them of being . My current favourite pre is an Electrocompaniet EC 4.6 . Second to that is the Gunter Steinhart , and then I also have the early Cyrus Pre . I guess that any of the 3 above are amazing pieces . The Journey has been the greatest part of my passion. I would change very little about it except to have kept a few pieces along the way instead of selling them. Changes were made (hopefully for the better ) since the OPT's are not Ultra Linear; so this is a pentode amplifier. The screen supply goes through a 1000 resistor to a 680F cap and then to both screens. Effectively the amp has dual power supply except for the shared anode supply. The shared 6K8 on the schematic was upped to 15K for the separate supplies to keep the voltage on the 12AT7 the same. Oh, and the output tubes have their own cathode resistor of 220R bypassed with a 1000uF 25V (running about 30mA per EL821). 260V on the anodes; 250 on the screens; 200V on anode load resistors on 12AT7. 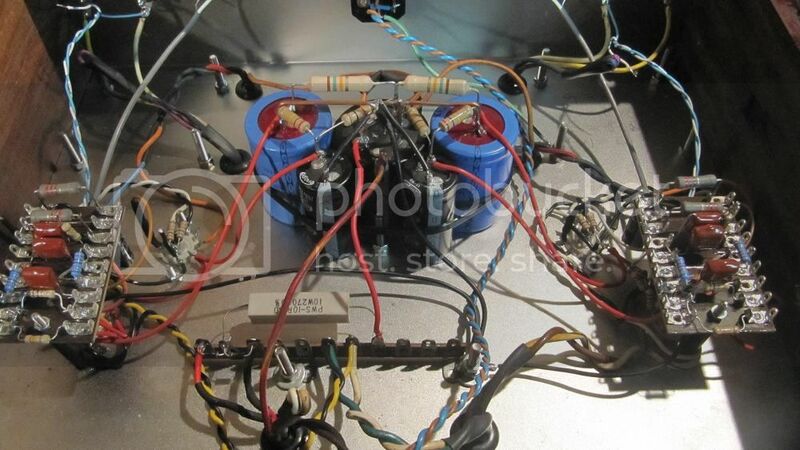 I did the NFB loop like on the schematic, but the amp has more bass and a better top end without the loop attached. Maybe the 27K resistor should be larger. Anyway, the 150K/0.22uF between the 12AT7 cathodes removes most of the distortion in the pre-amp. The amp sounds pretty clean without the NFB. " I was wondering if this little economical amp paired with my aforementioned Gunter Steinhart valve pre would be powerful and good enough to drive the Seas FA22RCZ in the ZOB cabs ? Apparently power is rated at about 8wpc and I'm hoping that that is at 8ohm . I must apologize for the the long period between this post and my last , been working 12 hour days on television production " Black Sails " season 3 and find it difficult to even check my email ( all-consuming ) . Anyways - Lemme know what you think please . I think they should work quite well together. What makes you say the amp puts out about 8 watts? 12w or more would be my uneducated guess? Hey Lin - that's what the person selling me the amp says it puts out . 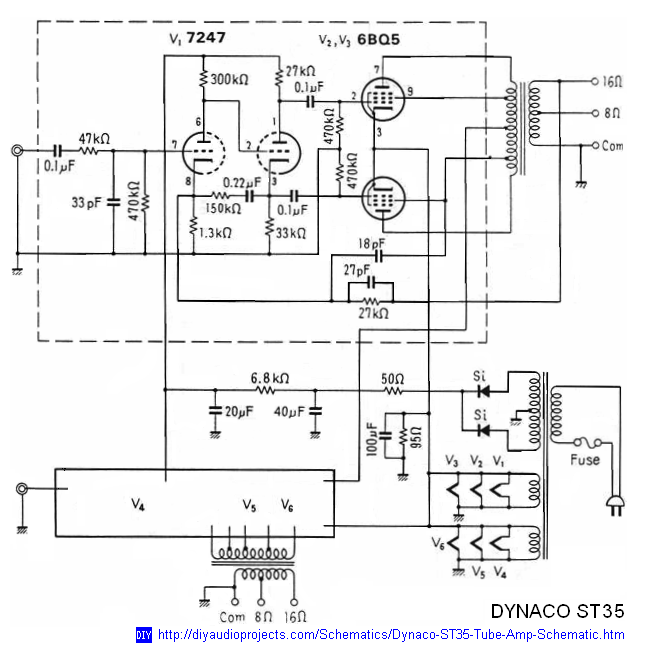 It's based on the Dynaco ST35 which supposedly puts out 17wpc and this unit uses ST35 transformers , I guess it must have to do with choice of valves too . I really don't know . Hopefully it is 12wpc or more . Efficiency of Seas fa22rcz is 94dB ( 2.83V 1m ) . 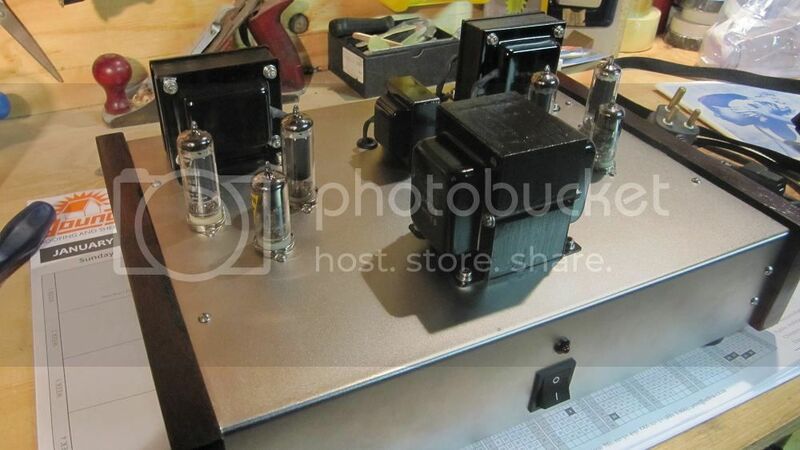 If it is 8w the amp should be coasting along; easy on parts/tubes. The Seas is closer to 90dB, but still should be a good combo in ZOB with your amp.